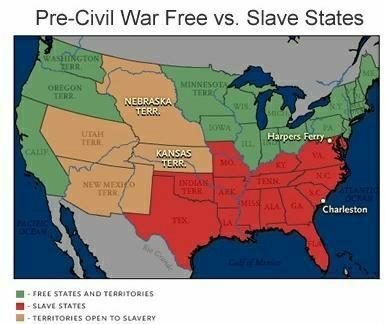 Maps show similarity between 2004 U.S. presidential election and pattern of free vs. slave states in pre-Civil War America. Claim: Maps show similarity between 2004 U.S. presidential election results and pattern of free vs. slave states in pre-Civil War America. Origins: This is another example for which it is difficult to assign a value of “True” or “False” — there is a basic (and somewhat superficial) underlying fact which is true, but interpretations of that fact’s significance are subjective and can be widely varied. It is true that a map showing the locations of free and slave states (and territories) in the pre-Civil War U.S. bears a rough resemblance to a map showing the electoral vote results for the 2004 U.S. presidential election. 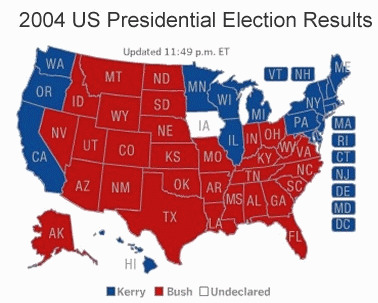 Senator John Kerry won most of the states in the northeast, the Great Lakes, and the Pacific coast regions, while President George W. Bush captured all of the south plus most of the midwestern, western, and plains states. However, the similarities between these maps mask some very significant differences. split in two, each creating a northern and a southern wing. In the subsequent presidential election the northern Whig/Republican party (represented by Abraham Lincoln of Illinois) didn’t even appear on the ballot in most southern states, and while the Southern Democratic party (represented by John C. Breckinridge of Kentucky) did make the ballot throughout most of the north, they rarely drew more than a relative handful of votes in those states. All four candidates captured at least one state’s electoral votes, a rarity in U.S. election history. According to exit polls and analysis of county-by-county election returns, the sharpest geographic distinction between the two candidates did not primarily correspond to region but to size of community: Senator John Kerry had a substantial 60%-39% edge in large cities (representing roughly 13% of the total U.S. population), while the reverse was true in rural areas (representing roughly 16% of the total U.S. population), where President Bush garnered a 59%-40% majority. What we saw in the 2004 election was more of an urban vs. rural division, regardless of state. Austin American-Statesman. 23 October 2004 (p. B1).